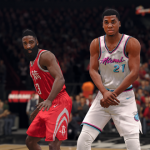 A new roster has come through for NBA Live 18, featuring updated lineups, adjusted ratings, and the newly unveiled City Edition jerseys for the Houston Rockets and Miami Heat. As with all roster updates, it will come through automatically as long as your PlayStation 4 or Xbox One has an active Internet connection when you fire up the game. This time around, the development team has returned to posting a spreadsheet listing all of the ratings changes, roster moves, and other updates. A few recent transactions are unaccounted for, but likely happened after the roster was finalised. Seeing as though we have roster editing functionality, we are able to manually make those moves ourselves. Check out the changelog spreadsheet here. As always, if you have any thoughts on the latest rosters, feel free to share them in the comments below, as well as join in the discussion here in the NBA Live 18 section of the NLSC Forum.